The software statistically calculates the probability of each SNP based upon the quality of the base assignments and the curves in the chromatogram files. Various filters allow for screening SNPs with specific thresholds or other features such as the type of mutation they induce. By looking at sequencer chromatograms directly, the user has excellent control over the probability of each potential SNP locus. Complete alignments, including all SNP and subsequence search listings, can be saved and re-edited at any time. Additional sequences can be added to existing projects. 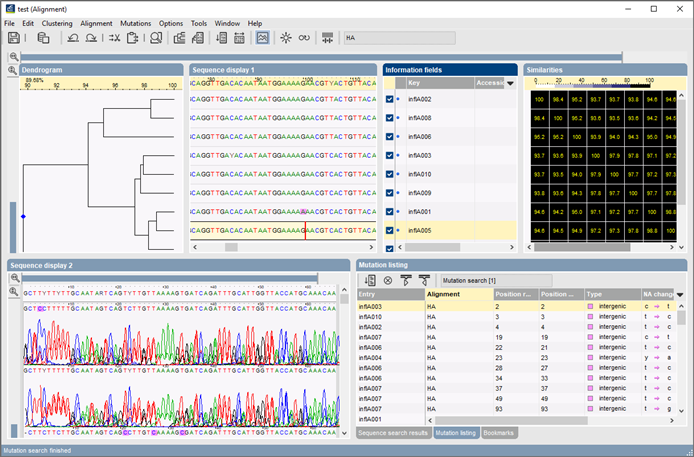 For searching SNPs on complete genomes, check out our new whole-genome SNP analysis application!